The warehouse at 250 Queen Ave. as seen through the rain on Friday afternoon. Here’s a new element in the mix of Albany’s industries: The production and processing of seeds of industrial hemp. 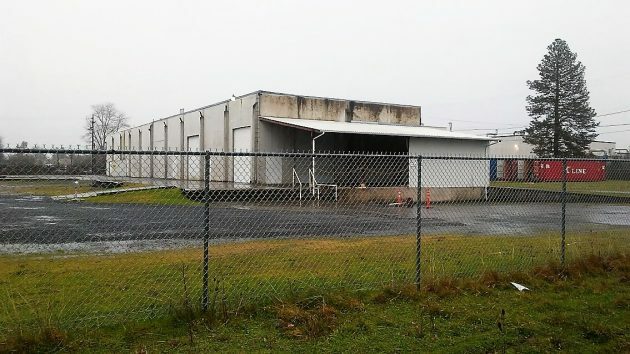 On Thursday the Albany Planning Division posted a public notice that it had received an application to review the site plan of a new use for a 10,000-square-foot warehouse at 250 Queen Ave. S.W. According to the city, the building would accommodate hemp seed production, processing and storage. The applicant is Seth Crawford, one of two brothers who run a hemp seed business out of Corvallis. Both are graduates of Oregon State University. They explain their background and the details of their business on their website, and you can look it up here. Hemp is a variety of cannabis sativa, the plant species that also includes marijuana. But hemp has much lower concentrations of THC, the psychoactive substance that makes marijuana interesting to its fans. The Oregon legislature authorized the growing of industrial hemp about seven or eight years ago. The state Department of Agriculture regulates the crop, which has any number of uses for industrial products and even food. A floor plan included with the application shows most of the interior of the building designated as grow areas, with a smaller section set aside for processing. The application says the business would use about 300 gallons of water per day. Staffing the place would be one employee at any one time and, on occasion, up to three. Outside, landscaping with drought-tolerant plans will be provided when the weather allows. The site is zoned for light industry and is surrounded by industrial properties. Review and approval of the site plan will be handled by the planning staff. No hearing is required. According to the Linn County tax department, the property is owned by someone who lives in California. In 2014 the property became tax exempt as a distribution warehouse for Teen Challenge. The owner last paid property taxes on the site in 2013, when the bill was about $8,900. The only thing that makes this article remotely interesting is hemp’s relationship to marijuana. And that relationship has political angles and generates lots of exaggerated claims. The reality is hemp will probably never be a big market in the U.S. There are too many better alternatives. There’s pretty much nothing to be done for a cross dog. Yipping, snarling, happiest spreadingunhappiness. The hook for the story is that somebody’s trying to put an empty building to a constructive use. Timing, capital, market development will affect the gamble. I know of at least one area farmer who contracted to grow a quite a large amount of hemp and has yet to be paid for the crop. This would appear to be a highly speculative venture that there is not yet much real demand for the end product. As long as the Department of Agriculture regulates the crop, we don’t have to worry. By the way, why does it? I clicked on Hasso’s link and spent way too much time reading almost everything on their website and additional stuff beyond. Very interesting; now I know a lot more about cannabis than I did yesterday. This is “industrial” hemp only by legal classification because the THC content doesn’t exceed 0.3 percent. There are specifications on how that’s supposed to be measured, but I’d have to go over it again and take notes, and perhaps still not be sure exactly how. This company sells plant material which contains high amounts of CBD and low amounts of THC, and seeds to grow it which produce only female plants. Prices mentioned informally are $1 per seed and 1 cent per milligram CBD content, wholesale only. It’s all federally legal (for now) and can be sold into other states and some other countries, with payment by civilized means (unlike recreational and medical pot shops which are cash-only). So, what’s the big deal about CBD? There’s research showing some benefit for seizures and maybe other conditions. But that’s just the tip of an iceberg which I don’t understand yet. It’s the “non-psychoactive” cannabinoid which nevertheless modifies the high from THC. Recently I noticed a locked display cabinet of high-CBD oils in my local quack-potion-and-organic-food store. Maybe $50 and up for small bottles, didn’t pay enough attention. I suspect a large semi-underground following (and market?) for CBD. Maybe someone here can point me in a useful direction and correct any misunderstandings. Entrepreneurialism is what makes capitalism work. People willing and ready to take risks that their endeavors will result in a payoff are the backbone of our capitalist system. More risk = more payoff, be it positive or negative. CBD (cannabinoid) oil is being investigate for its potential as a pain reliever; cannabis products need lots more research to determine their possible industrial and/or medical worth. Good luck to these guys, who are working entirely within the law and turning an idle property into an active economic resource. Many uses for hemp. One is readily available at WinCo here in Albany. It is tucked in nicely next to the other milk substitutes like Rice and Almond. Look and you’ll find it.